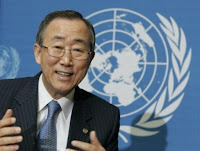 Lexington, KY -- Kentucky Equality Federation today praised the "leader of the world," United Nations Secretary-General Ban Ki-moon for being the first head of the United Nations to openly support equality for gay and lesbian people. Kentucky Equality Federation, a member of the International Lesbian and Gay Association (ILGA), a United Nations non-government consultant, has been trying for years to have sexual orientation and gender identity added to the United Nations Declaration of Human Rights. "This is truly extraordinary," stated Kentucky Equality Federation Founder and Public Advocate Jordan Palmer. "For LGBTI equality to reach the Office of the United Nations Secretary-General is remarkable and shows our worldwide struggle for equality. 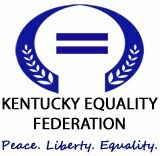 The International Lesbian and Gay Association and Kentucky Equality Federation will not stop until sexual orientation and gender identity are added as a protected class under United Nations law; after that, we will address the issue of gender-neutral marriage equality." Palmer continued: "This United Nations Secretary-General, as well as the United Nations High Commissioner for Human Rights seems willing." It is a pleasure to greet all the participants in this event taking place during the fifteenth regular session of the Human Rights Council. Human rights make up one of the three pillars of the United Nations, alongside development and peace and security. Protecting human rights means protecting the rights of everyone, without distinction or discrimination, and paying particular attention to the most vulnerable and marginalized, who may face special obstacles to the full enjoyment of their rights. In this context, I recognize the particular vulnerability of individuals who face criminal sanctions, including imprisonment and in some cases the death penalty, on the basis of their sexual orientation or gender identity. Laws criminalizing people on grounds of sexual orientation and gender identity violate the principle of non-discrimination. They also fuel violence, help to legitimize homophobia and contribute to a climate of hate. That is why, in May of this year, during a visit to Malawi, I called for such laws to be reformed worldwide. No doubt deeply-rooted cultural sensitivities can be aroused when we talk about sexual orientation. Social attitudes run deep and take time to change. But cultural considerations should not stand in the way of basic human rights. I hope that your discussions will further the inter-governmental dialogue on this issue and raise awareness of the need for reform. Please accept my best wishes for a successful event. Palmer continued: "I never thought I would witness the head of the United Nations making such a statement. It shows that LGBTI equality has finally reached a worldwide audience, and these people have the ability to make the changes necessary."